For over 125 years Goldfinch Brothers has been selling and installing replacement doors in Everett and the greater Seattle area. Their friendly and experienced staff are ready to help you pick out the perfect doors for your home or commercial project. From a single custom made closet door to replacing hundreds of doors in your office building, they will be able to help you find the right door for the job. Choose between different door types, styles, and materials as you can learn more about in the below sections. Goldfinch also understands the most important factors when it comes to buying doors for your home or commercial project, such as keeping your family, friends, tenants and staff safe. Thus, they only recommend the top door brands. Asides from safety, other considerations are energy efficient doors to help you save money and be more environmentally friendly. Talk to one of our friendly staff members to learn about other considerations as well. Is your door damaged? Perhaps door repairs are more applicable for your situation. Do you have a weird sized doorway that you can’t find a door for? Our team of door installers can make measurements to get custom doors made for your project. Doing a customizable door also allows you to get a door design that better matches the aesthetics of your home or office. There are a lot of materials that you can get your custom doors made with. Each door material option has it’s pros and cons, so be sure to ask one of our friendly staff if you have any door questions. For example, when picking a material it is good to consider if this door is going to be an exterior or interior custom door. 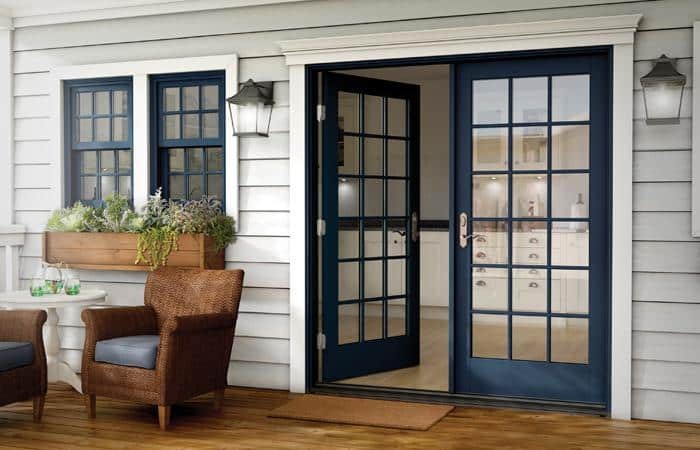 When picking a material for an exterior custom door it should be a strong material. If you’re looking for interior closet doors, then security is less of a factor so you can go with lighter materials. Some door designs include different patterns of specialty glass, to match the aesthetics of your home or office. Goldfinch Brothers only recommends the top door brands and manufacturers. After being in the business for so long, they know what it takes to be able to manufacture and design a high quality door. Our highly trusted door installers are some of the best in the industry. They will respect your property and your time.